This morning Jacqui came round to ring in the garden. It was a beautiful day but perhaps a tad too sunny for ringing (if the sun shines on the net, birds can see it more easily). Things started slowly with a Dunnock we'd caught before. 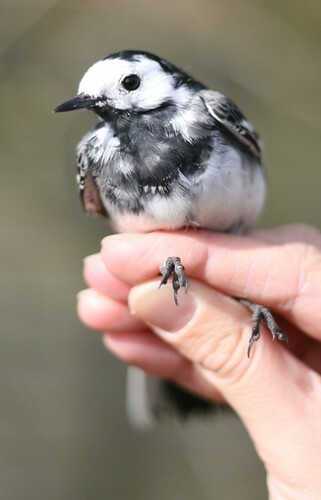 But soon we hit the jackpot with a female Pied Wagtail! That was totally unexpected... I saw the male singing from the roof yesterday but never though we'd catch one! 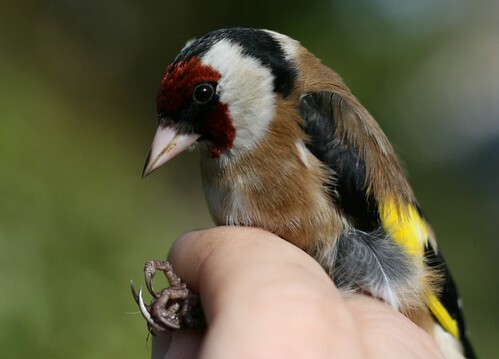 A lovely bird to handle... very soft feathers and with a beak totally ill-suited to vicious finger-pecking. Excellent. We also caught four new Reed Buntings - all males. It was interesting to see the differences between them. One had lost almost all the brown tips to his black head feathers, but others were much scruffier looking. It was a steady - rather than spectacular - catch, but that's just fine. Just about every other pond in the country is stuffed with frogs at the moment, but not mine. So I went to have a look for newts instead. Yesterday evening, while pulling out sheets of blanket weed, I accidentally scooped up a smart little male Smooth Newt. I admired his bright orange belly before putting him back. This morning, I saw another Smooth Newt (or maybe the same one) swimming about, and then a white stripe down at the bottom of the pond. I wasn't sure whether it was a root, but when I looked back again it had disappeared. So I'm hoping that was my first Great Crested Newt of the year - the males have silvery-white stripes down their sides. Must be quite useful when you're in a murky pond. Plenty of beetles and Backswimmers to be seen, too. Been ringing again, this time on our monthly visit to Beeston. It was really too windy to be very productive, but we did catch the first Yellowhammer for quite some time, an array of Greenfinches and Chaffinches, and a Goldfinch. Yesterday, we were very close to catching a Sparrowhawk, but by the time we'd legged it to the net, it had got out and flown off. I've been so busy lately that I've barely had any time for photos during the week, and I haven't managed much at weekends either. Hopefully normal service will soon be resumed. 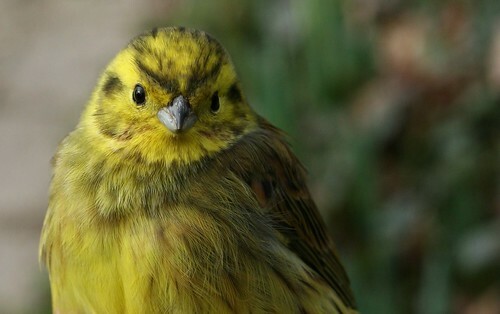 Highlights in the garden have been up to 15 Reed Buntings and four Yellowhammers. No sign of newts in the pond yet, though there have been a few Backswimmers and Lesser Diving Beetles pootling around.